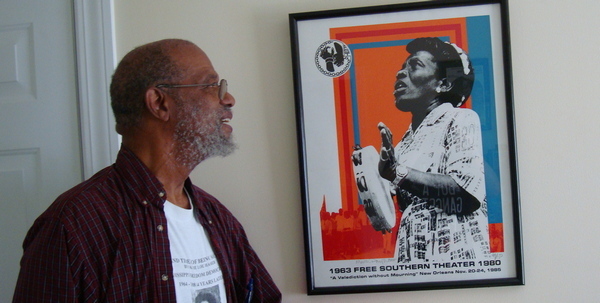 John O'Neal, who co-founded the Free Southern Theater as a part of SNCC during the Civil Rights Movement, died on February 14, 2019 at his home in New Orleans. Mr. O'Neal was a dear friend to, and a creative collaborator with, Roadside Theater. Here is a quotation from his play, Junebug Jabbo Jones: Don't Start Me to Talkin' or I'll Tell You Everything I know: Junebug and Bill saw everything inside of thirty or forty miles in every direction. They saw that in spite of the terrible conditions most of the colored people were living up under, in most sections it was more of them than there were white folk. If people could have just seen that, there's no telling what could have happened. Then again there was a whole bunch of white people that might as well to have been slaves for all they could get out of life. They seed that between the colored slaves and the poor white people didn't hardly nothin' get done around there unless they were the one's to do it . . . But everybody was so busy trying to keep their own heads from getting cracked, that they didn't take the time to stand back and look at the big picture that had everybody in it.